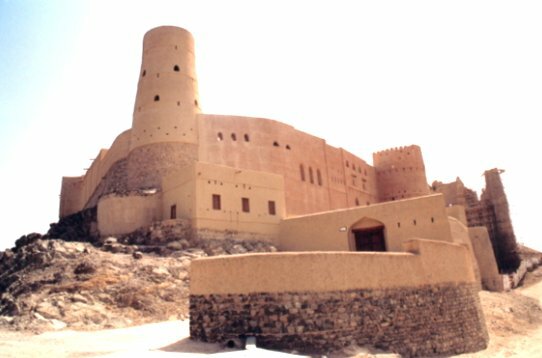 Bahla is one of four historic fortresses situated at the foot of the Djebel Akhdar highlands in Oman . The ruins of the immense fort, with its walls and towers of unbaked brick and its stone foundations, is a remarkable example of this type of fortification and attests to the power of the Banu Nebhan. Main feature is its 7-mile long walls which were patrolled by sentries night and day. The Fort's internal staircases and walls were built of mud, coated with gypsum and sarooj (a traditional type of mortar) which are as hard and solid as present-day cement.